Who are the people at risk of developing Glaucoma? How is Glaucoma and its severity / damage diagnosed? Glaucoma is a "silent killer" or like "slow poison". In most cases it begins un-noticeably and damages the eyes without any sign or symptom till it is very late and the patient is almost at the verge of blindness. This is the reason that awareness about glaucoma and its treatment is important to prevent this blinding disease. 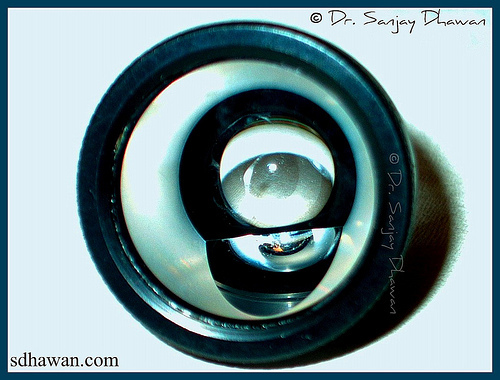 The contents of the eye-ball are under some pressure (intra-ocular pressure) which maintains the shape of the eye. In certain situations this pressure may rise and be detrimental to the functioning of the nerve of the eye (optic nerve). This is called Glaucoma. Rarely, pressure may not be increased but still damage to the optic nerve occurs because of its increased vulnerability, this is called normal tension or low tension glaucoma. The fluid of the eye (aqueous) circulates through anterior chamber and passing through the angle exits from the eye into the Canal of Schlemn. In open angle glaucoma the passage to the canal of Schelmn offer resistance to the flow of aqueous . In angle closure glaucoma the angle of the chamber is narrow or gets closed preventing the drainage of aqueous from the eye. Both the situations lead to increase in intraocular pressure. How does it lead to blindness? Increase in pressure in the eye leads to resistance to flow of blood into the eye leading to damage to vulnerable parts especially the optic nerve which carries the visual signals to the brain. First it leads to damage to some areas of visual field (the extent of surrounding visible to any one eye). This field loss progresses gradually till the eye is completely blind. Early field loss can be detected by test called Visual Field Examination or Perimetry. Injudicious use of steroids especially steriod eye drops. Certain eye conditions e.g. 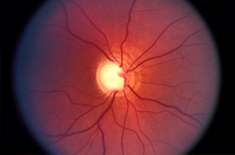 Retinal Vein Occlusions, Pseudo-exfoliation, Pigment Dispersion Syndrome, etc. At what age does Glaucoma occur? Mostly glaucoma affect people in the fifth decade of their life or later but it can occur at any age. Glaucoma can occur even in young children and infants (Developmental Glaucoma). Occurring before the age of 3 years it is called Congenital Glaucoma and between the age of 3 and 30-35 years it is called Juvenile Glaucoma. 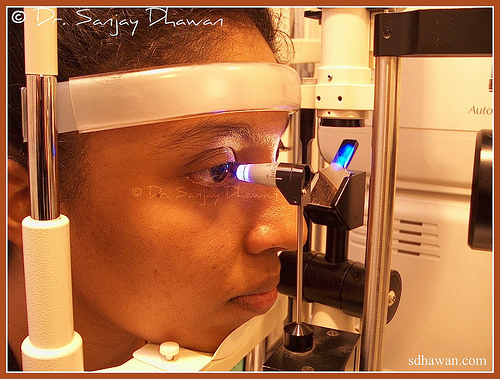 Treatment of glaucoma is more difficult in young patients and operation is required more often. Open angle type of glaucoma usually does not give rise to any symptoms in early stages. In late stages patients may feel pain in eyes and discomfort, and some individuals may notice field defects (inability to see certain areas of the field of vision). Usually this type of glaucoma is diagnosed on examination by a eye specialist either when he suspects it because of some risk factors or during the course during the course of a routine examination. Angle closure type of glaucoma can give rise to pain in the eye and headache with vomiting, seeing colored rings (haloes) around lights and redness in the eyes usually after coming out of a movie theatre. This type of glaucoma may occur as sudden attacks where there is severe pain in the eye, redness, watering, vomiting and blurring of vision. Glaucoma can be treated but the damage done by the disease can not be reversed or undone. Further damage to the eye by glaucoma can be stopped. Therefore, it is of utmost importance that the glaucoma be diagnosed and treated early before significant damage has been done. Intraocular Pressure (Eye Pressure): Measured by an instrument called Applanation Tonometer (generally accepted as standard), normally ranges between 11 and 21 mm Hg. It may be modestly raised in open angle glaucoma and markedly raised in angle closure glaucoma. In between the attacks of angle closure glaucoma it may be normal. It may vary at different times of the day and this variation can be measured by noting pressures round the clock at specified interval (Phasing / Diurnal Variation). In low tension or normal tension glaucoma the pressure may never be higher than normal range. Gonioscopy: A method to assess the angle of anterior chamber of the eye. It helps in diagnosing the type of glaucoma or even the vulnerability of the person to have attacks of angle closure glaucoma. Fundus: The retina and optic nerve of the eye can be seen by an instrument called ophthalmoscope. The optic disc undergoes characterstic changes in glaucoma which are noted by measuring cup : disc ratio or the C:D Ratio which is normally 0.3 to 0.4 and almost equal in both eyes. In open angle glaucoma and later stages of angle closure glaucoma it may be increased. This increase is usually proportionate to the extent of damage done. However, in some normal individuals also the C:D ratio may be increased. Visual Fields: Simply stated it measures the "area of vision" of a single eye, it also measures the sensitivity of each point in this area. Visual fields are now a days charted by instrument called Computerized Automated Perimeter (Humphrey is generally accepted as standard). In this test light patient is shown light targets of various size and brightness and note is made of the area where the patient can see this. The data thus collected is analysed and compared with data of normal population. Glaucoma gives rise to characteristic field defects which progress in a peculiar manner. 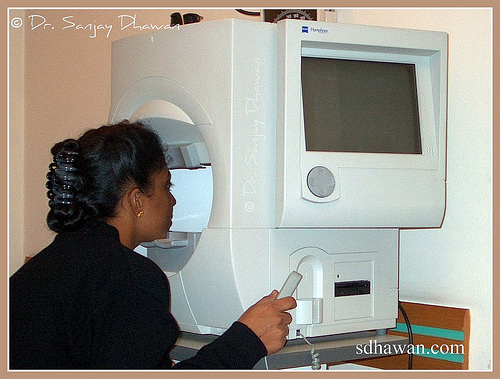 This is the definitive test to not only detect glaucoma but also assess the severity and extent of damage. 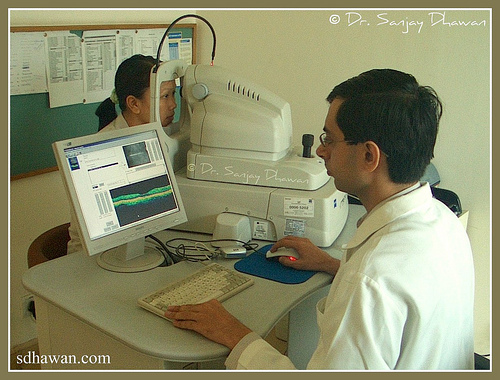 The adequacy of the treatment is best judged by visual field charting done at regular intervals. OCT / HRT: Ocular Coherence Tomography (OCT) & Heidleberg Retinal Topography (HRT) are sophisticated imaging techniques which help in evaluation of optic nerve head & retinal nerve fiber layer. They help in objective quantification of the damage caused to the nerve fibers. Patient compliance or reliability about taking drugs and follow up examination. Decision regarding what treatment and when to be used should be left to the judgment of consulting eye surgeon. Detected early and treated properly, glaucoma is perfectly compatible with life long good vision. If neglected it can end in blindness. What if a person has both Cataract & Glaucoma? Co-existence of glaucoma & cataract pose difficulty in management of either. There is always a dilemma whether to operate them together or one at a time. As a general principle, in cases of patient with both Cataract & Glaucoma it is desirable to control glaucoma first and then proceed for cataract surgery. If the pressure / glaucoma control is easily achieved by 1-2 drugs then one can go for cataract surgery without worrying about glaucoma. In cases of advanced glaucoma or when the pressure requires more than 2-3 drugs for control then one may have to consider glaucoma surgery. Although it is possible to do both glaucoma & cataract surgery together at the same time, however, the results may be slightly compromised. It is ideal to do glaucoma surgery first and cataract surgery later, if the clinical condition of the eye & the patient permits. Only in advanced glaucoma & advanced cataract with impending complications, is it justified to proceed with Combined Cataract & Glaucoma Surgery also called Phaco-Trab or Phacotrabeculectomy.